I've been doing crafts for years, usually small stuff - scarves, belts, crocheting, bags, etc. But we purchased a house last spring, so I've been preoccupied with trying to make all of our home decor fit together in a cohesive manner. 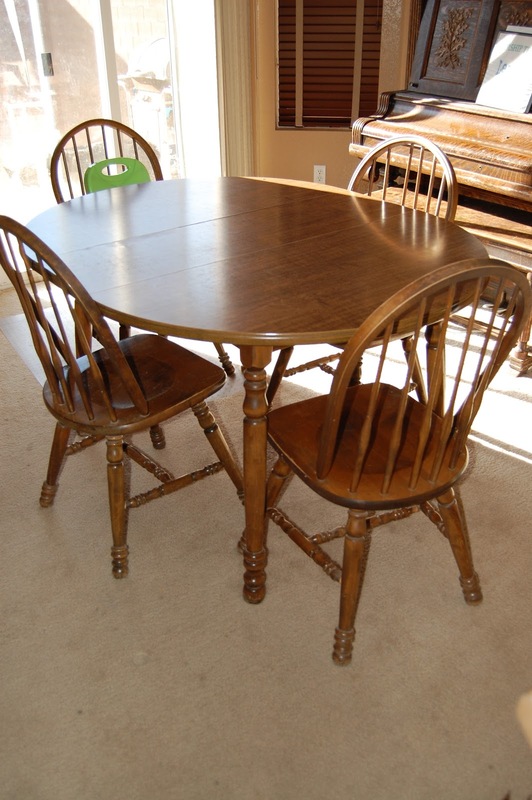 But the table we have in the dining room is old and out dated and I'm not a huge fan of it. My parents gave us their table a couple of years ago. It's the same one we had growing up - from the 80's with a nice shiny veneer finish on the top. Outdated. 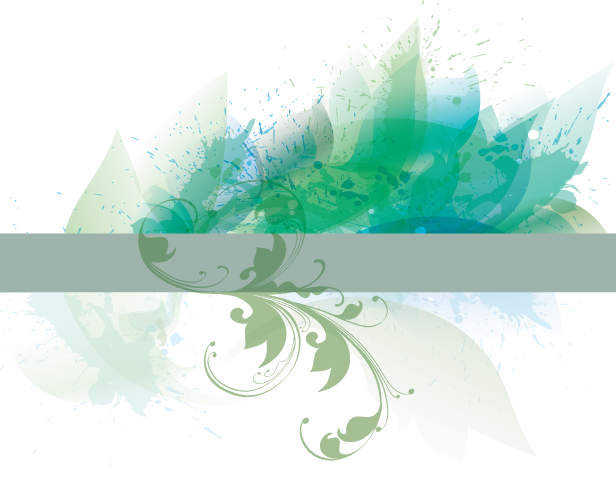 So I decided it needed a makeover. This was my first DIY furniture refinishing project. 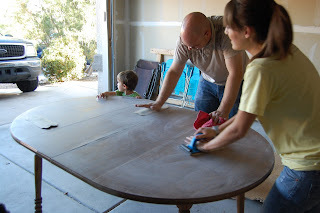 This is what our table looked like before. Blah. Notice the Shiny table top. And this is our table afterwards. In addition to our table looking outdated, we have successfully broken all but one chair. Seriously...how do we manage? 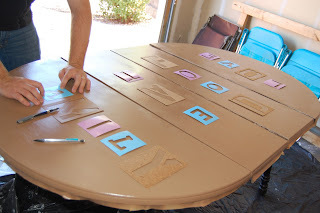 We were able to manage to fix 4 of the 7 chairs with wood glue, but we still had to come up with a couple more chairs. So I went thrifting and found a couple chairs - mismatched chairs. I want an eclectic look. Remember Monica's kitchen table from the show, Friends? (I tried to find a pic of it, but couldn't...but I didn't look too hard either.) Anyway, I've always loved how her chairs were mismatched. I've always wanted to do something similar. I wanted more mismatched chairs than what we have pictured, but after several trips to several thrift stores, I've found that individual chairs are hard to find...and they cost about $10 a piece. (why??? It's just a lonely chair!!) I probably need to start checking for them in garage sales instead. I was only able to score a couple...and the dealers weren't willing to sell one chair from a set (boo). So for now, we'll use what we have, and I'll replace them as I find more chairs (that cost less than $10 a piece). 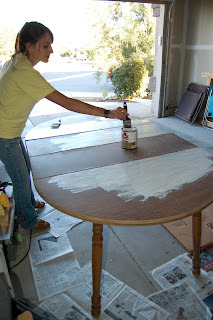 Next we put primer sealer on the table top. 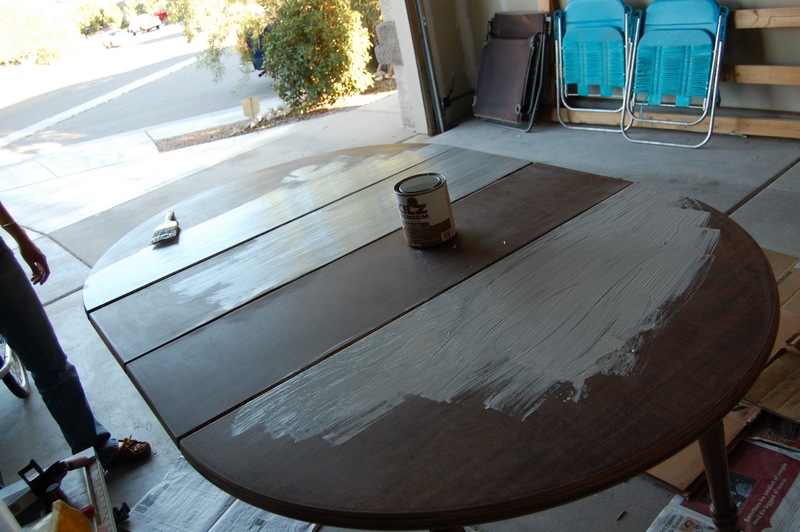 (We actually had to do a couple coats) This allowed the paint to stick to the veneer finish. Notice how the table leaves are all disconnected? We did this to keep them from sticking together as they dried. 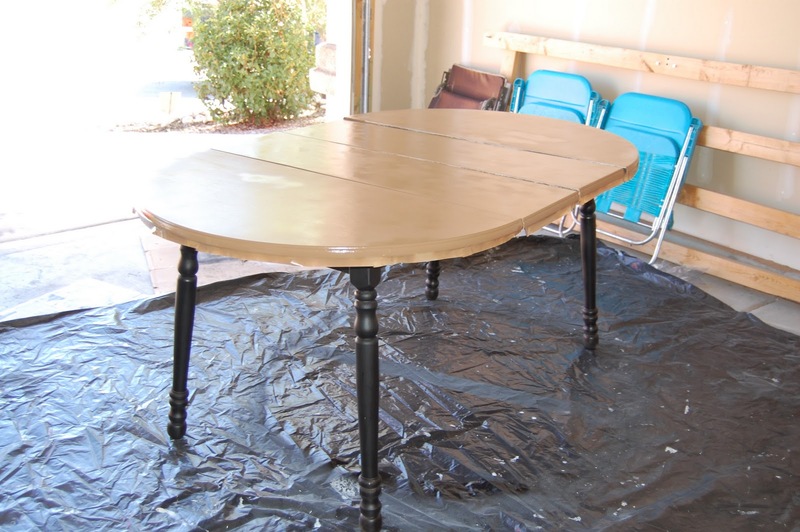 After the primer sealer dried, we took out the two middle leaves, and spray painted the legs black as well as the edges of the table. Notice how the picture looks cloudy? That was because there was so much spray paint in the air, that when the camera flashed, the light reflected off all the paint in the air. Awesome. Ha ha. 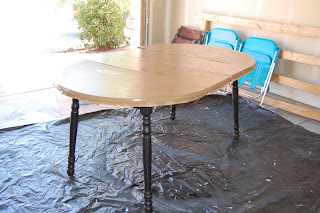 Then we taped around the edges, and spray painted the top of the table brown. Once the paint was dry, we plotted out where each word would be placed and what letter to use, and traced them onto the table with a pen. Here's where I made a mistake. After we painted the letters onto the table and once they were dry, I painted on the final coat - polyurethane. BUT when I did this, the black paint from the letters started to smear onto brown paint. Ahhhh!!! 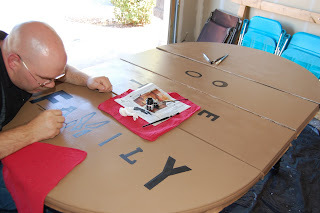 If you look at the bottom of the "Y", you can see how the black paint bled onto the brown paint. So I thought that maybe if I waited longer for the paint to dry that it wouldn't smear. Not so much. Same results. It got so bad I finally decided to redo the whole leaf that said "Family". So I sanded the leaf back down to the primer sealer layer and repainted. This time I used polyurethane that sprays on. 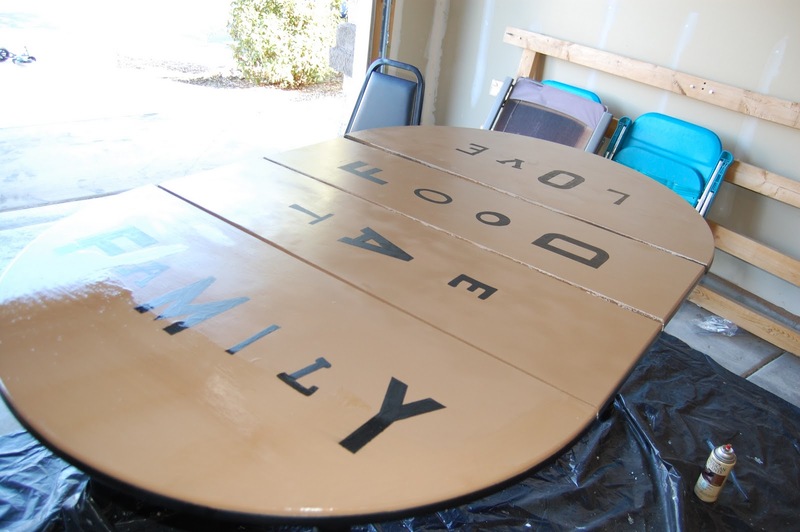 (I did several coats) and then I painted on the polyurethane for a finishing touch. Much better results. No paint bleeding. 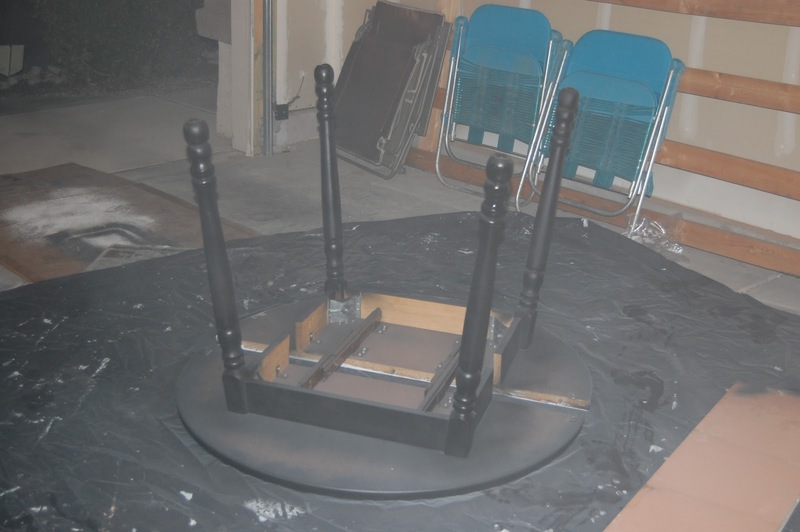 The final step was to sand down all the chairs and paint them black. I used a bucket of paint for the chairs, because it ended up being cheaper than several cans of spray paint. The final step was to paint polyurethane on all the chairs and let dry. Here is the finished project. I'm pleased with the results, but I learned a lot from this project. It was time consuming and it ended up costing a lot more than I realized. $250 to $300 (at least) - I lost track of how much everything cost. Waaay more than I expected. The purpose of this project was to redo our table in order to prevent spending money on a new one. But with all the time and money put into, we could have easily found a pretty decent one on Craigslist for the amount of money that we put into redoing our current one. But I like my table now, and at least I have a unique piece of furniture. So if you decide to do a project like this, make sure you have an accurate idea of how much it will cost.